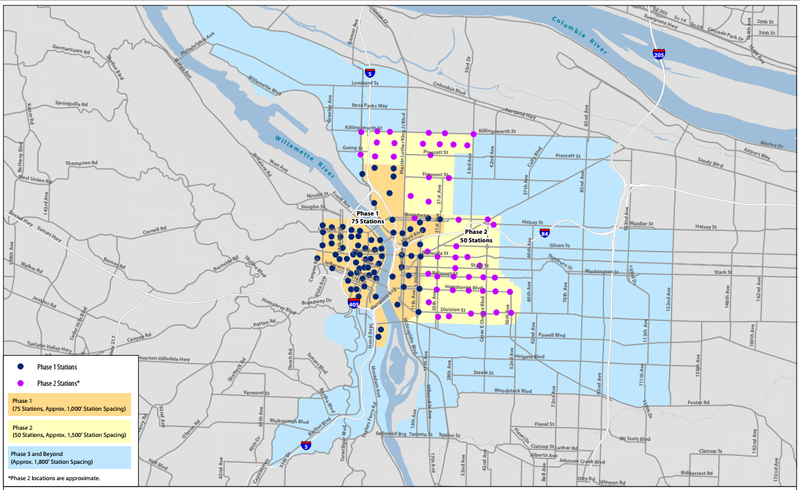 This past week, TriMet released its first draft proposal for improved bus service in East County (essentially, anything east of Interstate 205 and north of Mt. Scott). Like the recently similar proposal for the SW Metro area, the new Eastside Plan is an effort being done in parallel with a rapid transit project (the Powell/Division BRT), but does not include that project itself; instead it focuses on (mostly) non-capital improvements to bus service: new routes, re-routings, and improvements to frequency and/or span of service. (A few proposed changes require new streets be completed). And as Bike Portland reports, one of the proposed changes will soon come to fruition: The 71 between Lents and Parkrose via 122nd, will become a frequent service route once Portland completes some improvements. (It appears that this line will be disconnected from the western leg of the 71 at Parkrose; whether that will be joined with another line or not, I do not know). Portland Transport was invited along with other local media to cover Friday Morning’s TriMet Orange Line “First Ride” press event. The video also includes footage out the window and from the cab during the round-trip, interspersed with the questions (although it does not necessarily match the timeline of the interviews). TriMet held a celebratory press event today, with the first-ever passenger service on the Orange Line and across the new Tilikum Crossing. We were able to conduct interviews with Governor Brown, Senator Merkley, Commissioner Novick, TriMet’s Neil McFarlane and others. Those interviews will be posted tomorrow. For now… A teaser with a bit of transit geekery: On the return journey from Oak Grove to Downtown Portland, I filmed a view from the operator’s cab of the complete journey. Unfortunately, we weren’t going at full speed much of the time, which would have been really nice to witness. The train slowed for workers along the tracks, and for yellow signals. (There were actually TWO “first ride” trains today. On our initial journey, we rode the first, and on the way back, we rode the second). Total trip time was 25 minutes, but when the line operates in regular service, that time will be approx. 17 minutes Update: 25 minutes, see below from SW 3rd and Lincoln downtown to Park Ave. in Oak Grove. The video includes the statement that the trip time when the line opens will be 17 minutes. I have learned that this is incorrect. During the first preview ride, 17 minutes was announced as our trip time, but in fact we had skipped many platforms. It was not an official statement of the final schedule. I have confirmed with TriMet that when the line opens, Park Ave. to PSU will be approx. 25 minutes, including all station dwell times.